"MyObservatory" is a very popular official weather app providing location-specific weather service in Hong Kong. 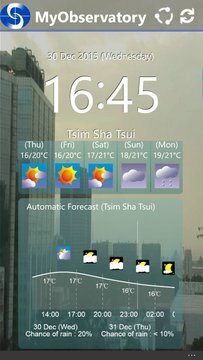 The app provides temperature, relative humidity, rainfall, wind direction and speed, weather photo collected from nearby meteorological stations according to user’s actual or designated location (in the territory of Hong Kong). In case meteorological data is not available from nearby stations, data from other meteorological stations (e.g. stations at headquarter of the Observatory, King’s Park, and Star Ferry, etc.) will be used instead. The app also comes along with a suit of services from the Observatory such as 9-day forecast, forecast track for tropical cyclones, world major city forecasts, imageries for radar, satellite, lightning locations, etc. By activating notification service, alert messages will be delivered to user’s smartphone automatically whenever there is any change in weather warning signals. The Special Weather Tips also alert user of any upcoming and significant change in weather conditions. With the "Location-based Rain Forecast" service, user can easily get hold of the rainfall forecast in the coming two hours specific to their actual or designated location. Currently, not all functions of the"MyObservatory" (Version 1.4) is supported by the Windows 10 platform. Users cannot receive weather warning notifications on Windows Phone 10.